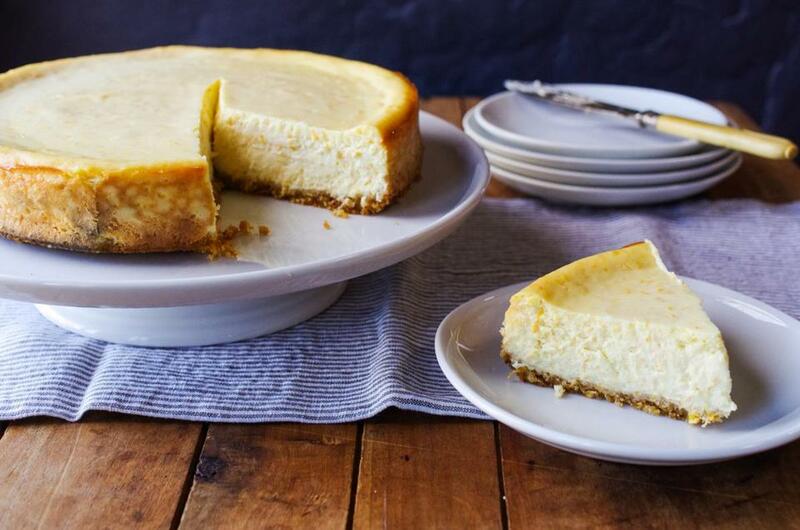 Lighter and leaner than cream-cheese cheesecake, this ricotta version can be baked days ahead. The crust is made from anisette toast cookies or another dry biscotti, crushed into crumbs and mixed with butter before pressing into the bottom of a springform pan. The filling uses whole-milk ricotta and the rind of three oranges, so it has lots of citrus flavor. You can make it, cool it overnight, and take it in the springform to a party. When you get where you’re going, loosen the sides of the cake from the pan, unlatch the spring, and lift it off. Transfer the cake, on the pan bottom, to a platter. Don’t even think about lifting the cake off the pan bottom; it’s a sturdy cake, but not that sturdy. Cut the cake with a thin-bladed, sharp knife (bring your own if you’re taking the cheesecake somewhere; you never know). The orange filling is firm enough to serve in neat slices. 1. Set the oven at 375 degrees. Butter a 9-inch springform pan. 2. In a large bowl combine the anisette toast crumbs and brown sugar. Stir in the butter and use a large rubber spatula to mix it in until evenly blended. Transfer the mixture to the pan and press evenly onto the bottom. 3. Bake for 5 minutes or until the edges are golden brown. Set the pan on a wire rack to cool. Lower the oven temperature to 325 degrees. 1. In an electric mixer set on low speed, beat the ricotta cheese and granulated sugar to blend them. Beat in the eggs, one at a time, followed by the flour, vanilla, and orange rind. Pour the mixture into the crust. 2. Bake for 1 hour or until the edges are set and the center is slightly jiggly. 3. Remove from the oven and set the pan on a wire rack to cool to room temperature. Cover with plastic wrap and refrigerate overnight.